Gumjasti škornji primerni za lovce, ribiče, imajo izreden oprijem. Neoprene is an excellent heat insulator. 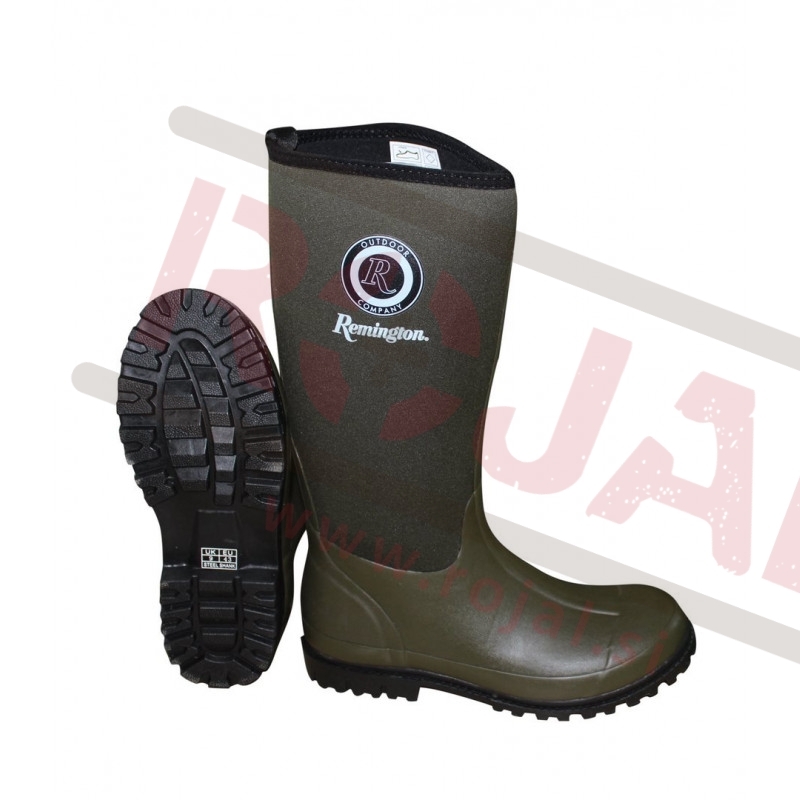 The porous structure allows comfortable use of boots in a wide temperature range from -25 to +25 C with a thin toe and from -40 to + 50 with thermal socks. In addition, neoprene is resistant to extreme temperatures, so for a short time, the boots can be used in an environment with temperatures ranging from -60 to + 30C. Shoes perfectly retain heat inside the boot, repels cold, heat and moisture outside, which is very important for working in aggressive climatic conditions. In other words - comfortable wearing ensured throughout the year , especially in winter and summer. The second part of the top of the boot is a composite welding wadding made of natural rubber, which, in combination with a neoprene boot, perfectly protects against moisture and water ingress into the interior of the shoe. Neoprene, as a stocking, fits tightly to the leg. If a person falls into the water, Remington boots will not allow his feet to get wet (provided that he is fully but briefly immersed in water). "Breathable" material and thermal insulator completely eliminates the possibility of frostbite, overheating of the legs (with reasonable operation), the hydrophilic outer layer absorbs excess moisture from the legs. Thus, the boots literally regulate a comfortable "atmosphere" inside the shoe. Neoprene and rubber tops of boots are very elastic, have high durable characteristics, are resistant to repeated bends, durable and reliable.